Whether you are applying to Princeton, Penn State, or Pomona, you want to do your best on the SAT exam. As part of a comprehensive SAT test prep course, you should learn a few of the basic strategies for standardized test-taking. Prepare with our SAT Study Guide and Practice Questions. Print or eBook. Guaranteed to raise your score. Get started today! In the multiple-choice sections of the SAT test, it may be wise to answer the easiest questions first. Not every SAT test question is alike in difficulty, and you can make some rapid progress and build confidence by knocking out the easiest questions right off the bat. On more difficult questions, try to eliminate as many wrong answers as possible before making a guess. Be sure to read the entire question and every possible answer with care before making your selection. If you realize that you will be unable to finish a particular section of the exam, try not to panic. It will be more beneficial to continue working carefully and answer as many questions as you can. In order to get used to the length and duration of the SAT exam, you may want to take an SAT practice test. There are a number of SAT practice tests on the market that allow students to get used to the pace and structure of the exam. These practice exams also contain SAT test samples that give you a taste of what questions on the real exam will be like. On the essay portion of the new SAT test, some of the same guidelines apply. Be sure to read the passage and prompt entirely and thoroughly before you begin writing; no matter how eloquent and thoughtful your writing is, if it is not on-topic it will receive a low score. If possible, try to include colorful examples and evidence for your position whenever possible. SAT Flashcards. 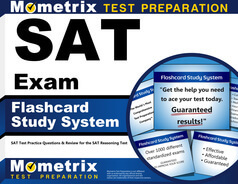 Proven SAT test flashcards raise your score on the SAT test. Guaranteed. It is perfectly acceptable to use examples from your personal life if they are appropriate. Many students have been trained to avoid mentioning themselves when writing a formal essay, but the point of the SAT test writing section is to develop a point of view, so it is acceptable to use the personal pronoun “I” and refer to events and ideas from your own life. In fact, your SAT test scores will go up if you can illustrate how the essay prompt applies to your own life. 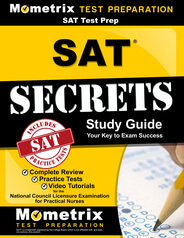 When you sit for the SAT examination, you should be ready to take a deep breath and do your best. As long as you have worked hard in your SAT test review, you should have nothing to worry about!